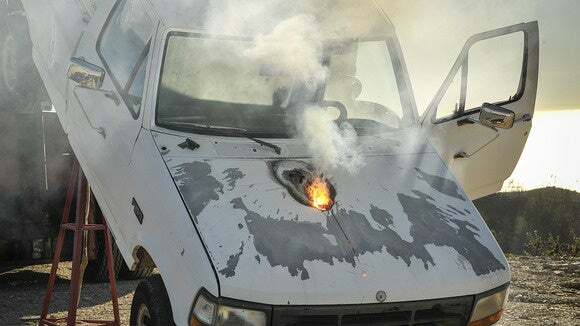 A successful test of Lockheed Martin’s ATHENA military laser punched a hole through a running Ford F-150 pickup truck at more than a mile away, proving that military grade lasers are anything but science fiction. In fact, ATHENA’s power is orders of magnitude higher than what the Terminator requested in the movie of the same name: instead of a phased plasma rifle in the 40-watt range, ATHENA directs 30 kilowatts of energy downrange. ATHENA is based on the Area Defense Anti-Munitions (ADAM) laser weapon system developed by Lockheed Martin in Sunnyvale, Calif., which has been proven to be effective against small airborne and sea-based targets, according to the company. It incorporates the 30-kilowatt Accelerated Laser Demonstration Initiative (ALADIN) fiber laser. Lockheed Martin said that the system combines multiple fiber lasers into a single, unified beam using a technique called spectral beam combining that’s much more powerful than the individual laser modules themselves. The poor truck in question was apparently parked, motor and drive train running, to similar something akin to a real-world scenario. Lockheed said that the laser burned through the engine manifold in just seconds, from more than a mile away. Based upon the photo of the truck that Lockheed Martin released, the pickup was undoubtedly not moving, and the laser must have been computer-guided to enable such as tight, compact hole. But whatever the scenario, it’s hard to argue with the result. Why this matters: Um, have you seen the picture of the truck? And that it happened from a mile away?